Rainbow Brite blasts off at Dynamite for those nostalgic for the 80s – AiPT! Beloved ’80s character returns for new ongoing series this October. If you were a child of the 80s you may want to sit up for this one. Rainbow Brite is getting her own comic book compliments of Dynamite Entertainment this October. Written by Jeremy Whitley and art by Brittney Williams this series is written for younger readers in mind. Jeremy Whitley is scheduled to sign Rainbow Brite posters from 4-5:30pm on Saturday, July 21 at the PopMinded by Hallmark booth #1505 at San Diego Comic-Con 2018. Read more about the upcoming title below. July 17, 2018, Mt. Laurel, NJ: Dynamite Entertainment and Hallmark today announced the classic character Rainbow Brite comes to comics and brings a little color to your life! The adventure begins for children and adults alike, as writer Jeremy Whitley (My Little Pony, Unstoppable Wasp) and artist Brittney Williams (Patsy Walker, A.K.A. Hellcat!, Goldie Vance) deliver a brand new all-ages monthly series. Following the massive success of younger reader titles such as Grumpy Cat, Boo: The World’s Cutest Dog, and Bob’s Burgers, Dynamite Entertainment welcomes the most colorful girl in the world, Rainbow Brite, to their fall 2018 lineup. “The world needs a young hero clad in a rainbow now more than ever in a world where things are often simplified into black and white and it’s easy for people to turn their back on people not like them,” added Whitley. The debut issue of Rainbow Brite #1 delivers a wide selection of cover variants, providing fans and retailers a chance to collect the whole set! The cover artwork features the talents of Paulina Ganucheau (Zodiac Starforce), Tony Fleecs (My Little Pony), and a classic cover, respectively. A Blank Authentix Edition will be available as a variant for Rainbow Brite #1 featuring the same great story, but with a blank cover for fans to get their favorite artist to draw their version of Rainbow Brite and friends. Rainbow Brite #1 will be solicited in Diamond Comic Distributors’ August 2018 Previews catalog, the premier source of merchandise for the comic book specialty market, and slated for release in October 2018. 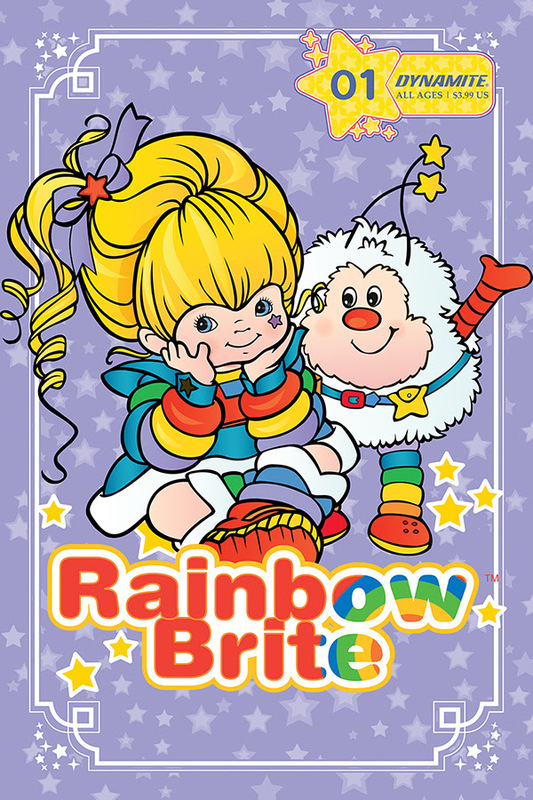 Comic book fans are encouraged to reserve copies of Rainbow Brite #1 with their local comic book retailers. Rainbow Brite #1 will also be available for individual customer purchase through digital platforms courtesy of Comixology, Kindle, iBooks, Google Play, Dynamite Digital, iVerse, Madefire, and Dark Horse Digital.